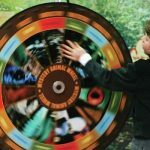 Sloan Museum Rainforest Adventure Maze Exhibit at Courtland Center Mall review, pics, hours, and info. 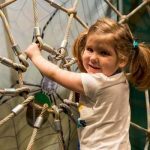 The Sloan Museum in Flint is hosting the Rainforest Adventure Maze exhibit starting January 19, 2019. The Rainforest Adventure Maze has been relocated to a new and temporary location at Courtland Center Mall in Burton during Sloan Museum’s renovation. Sloan Museum’s new 10,000 square-foot exhibition space inside Courtland Center Mall is the temporary home of over 30 historic vehicles from Sloan Museum’s automotive collection, as well as hands-on traveling exhibits. The Sloan Museum location at Courtland Center still has a gift shop, rental space for community events, and even Wisner’s Whizbang Emporium, an interactive play area for families. Sloan’s Rainforest Adventure Maze exhibit is an exhibit with immersive displays and hands-on activities. Visitors can explore the Rainforest Adventure in two interactive mazes, Rainforest Adventure and Tropical Odyssey. Both mazes are full of the sights and sounds of a tropical rainforest, with puzzles and physical challenges that are great for ages 4 to adult. Visitors answer challenge questions to move through each maze. Wrong answers lead to dead-ends, while correct answers lead to the next section of the maze. 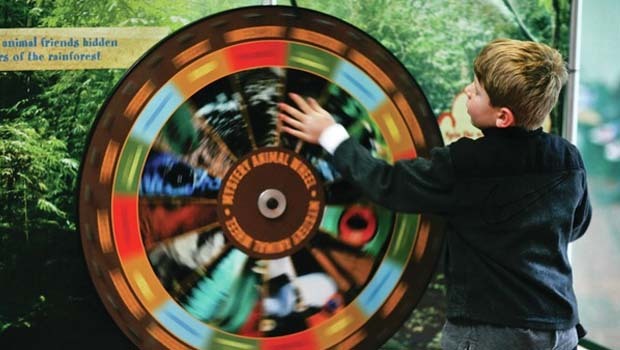 In Rainforest Adventure, visitors move through the four layers of the rainforest and learn about its inhabitants. By the time visitors reach the forest floor, they will have learned more about how humans impact the rainforest, and how they can make a difference. The second maze, Tropical Odyssey, tells the story of butterfly farming in the rainforest. Visitors follow the lifecycle of a butterfly as they learn about rainforest practices, rescue caterpillars from predators, help feed them, solve puzzles, and zipline through the rainforest canopy. In addition to the exhibit, families can visit the play area and the gift shop, and view the historic vehicles during their visit. Tickets to see the Rainforest Adventure exhibit are – Non-resident tickets are $7 for adults, $6 for seniors, and $5 for kids ages 2-11. To reserve them online in advance of your visit, go to sloanlongway.org/dinosaurs or call 810-237-3450. Admission is free for Genesee County residents and members. Note: Free admission on Martin Luther King Day for non-residents as well! This Sloan Museum exhibit is located inside Courtland Center. Please enter through the main mall entrance near El Cozumel Mexican Grill.